Before injecting vaccine, pull back slightly on syringe plunger. If blood enters the syringe freely, choose another injection site. A recommended vaccination schedule should start at or about 6 weeks of age. The presence of maternal antibody is known to interfere with the development of active immunity. Puppies should be revaccinated every 2 to 3 weeks until at least 16 weeks of age. 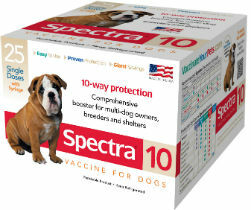 All dogs over 12 weeks of age should initially receive one dose of Spectra® 10 and a second dose 2 to 3 weeks later. Annual revaccination with a single dose is recommended.